Extremophiles are microbes that live in conditions that would kill other creatures. It was not until the 1970's that such creatures were recognized, but the more researchers look, the more they discover that most archaea, some bacteria and a few protists can survive in the harshest and strangest of environments. 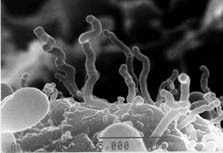 addition, the research into extremophile microbes has led to the confirmation that the new domain of living organisms - the archaea exists. Archaea are not the only extremophiles, there are some eukaryotes that live in such conditions. What are the environmental need of microbes? Extremophiles show how flexible life can be regarding its needs and its habitats. Some of these microbes, particularly some bacteria and archaea, also appear very simple in their composition. Would it be possible to create one of these microbes in the Laboratory? Most space environments are cold and NASA researchers are particularly interested in microbes that can survive at low temperatures. Recently interest has focused on Lake Vostok in Antarctica. NASA has had a research expedition working at the lake throughout 1998 and 1999. Lake Vostok is a huge freshwater lake which has been frozen for perhaps a million years. Ice samples have been retrieved from depths of nearly 4000m (1200 feet), and a diverse assortment of bacterial species has been recovered. At these depths the microbes have been cut off from sunlight and other energy sources for a considerable time and are in a dormant state, but still metabolizing at a very low-level of activity. These findings are a good sign for the possibility of life being able to survive on Europa, the ice-bound moon of Jupiter. When water freezes, the life can go into suspension and remain that way almost indefinitely until temperatures increase to a level where activity can resume - ie liquid water. In 1998, Richard Hoover of NASA's Marshall Space Sciences Laboratory and Dr S S Abyzov of the Russian Academy of Sciences found ice cores from Lake Vostok contained microbes like one (above) which is yet to be identified. Other life forms recovered from the lake ice at depths as much as 3.5 km (about 2 miles) down have been more recognizable and include cyanobacteria, bacteria, fungi, spores, pollen grains, and diatoms. These organisms are thought to have become trapped in the ice about 400,000 years ago. In 1998, Richard Hoover of NASA's Marshall Space Sciences Laboratory and Dr S S Abyzov of the Russian Academy of Sciences found ice cores from Lake Vostock contained microbes like one (above) which is yet to be identified. Other life forms recovered from the lake ice at depths as much as 3.5 km (about 2 miles) down have been more recognizable and include cyanobacteria, bacteria, fungi, spores, pollen grains, and diatoms. These organisms are thought to have become trapped in the ice about 400,000 years ago. Acid environments usually occur around active geothermal vents. Though the immediate locality of such springs may be hot, the temperature soon falls off outside the active areas. Many of these hot springs are contaminated with sulfur, however, and the water pH can be below five - acidic. Also acidity, unlike heat, does not fall off outside the area of geological activity. Other places where acidophiles occur include polluted places, where industry or mining has left acidic waste. Acidophiles, however, cannot tolerate acid internally as this would break down their cell structure, and they devote much effort to preventing their environment from causing them damage. They produce special enzymes for this task, and such enzymes have commercial applications in many areas. Alkaliphiles live at the other extreme. Typical environments include carbonate-rich soils and soda beds - the remnants of dried lakes. These are found in dry climates such as the East African Rift Valley and the Mojave Desert. As with acidophiles and for the same reasons, alkaliphiles keep the alkali outside the cells by the use of enzymes. Another group called halophiles, live in salty environments. These are usually dried lake-beds and salt-flats. Such environments can also become highly alkaline, so the microbes that live there need to contend with both high salt and alkalinity. The problem for salt-dwellers is dehydration through osmosis and this is overcome by the organism balancing the concentrations of solute inside and outside the cell. Salts concentrate through lake evaporation, and such lakes are common in hot dry regions of the world. Typical air temperature conditions in salty lake beds are high, frequently over 40 C (more than 100 F), with subsurface water temperatures reaching as much as 65 C (150F). So the halophiles are often thermophiles as well! Such lakes exist in California, Israel (Dead Sea), Kenya, Australia and Mongolia. Bacteria and Archaea live in hot springs heated by geothermal reactions deep in the Earth. Some springs reach temperatures of 80 C (177F). The discovery of these heat-loving bacteria is credited to Professor Thomas D Brock, formerly of the University of Wisconsin at Madison. The bacteria, Thermus aquaticus, live in the hot springs of Yellowstone National Park, Wyoming, and its discovery led to the development of a highly useful bio-technology called Polymerase Chain Reaction (PCR). This is used for a wide variety of purposes including the production of sugar from vegetable matter at high temperatures, in forensic genetic fingerprinting, in medical diagnosis and in screening for genetic and other diseases. (Left) The orange scum is bacterial in origin. Whakarewarewa Thermal Reserve in Rotorua New Zealand. © Cassandra Hoyland, 1999. 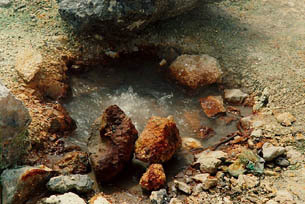 (Right) The rusty color on the rocks of this volcanic pool is Sulfolobus solfataricus. It lives near mount Vesuvius in Italy. 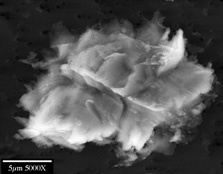 Professor Brock's team also discovered organisms living in highly acidic hot springs, Sulfolobus acidocaldarius, and this proved to be archaean. But the most important conclusion that Professor Brock reached was that life can exist anywhere that water remains liquid. This assertion has far-reaching implications for the search for life off planet Earth, and effectively lays the basic ground rules. t should be remembered that water boils at 100 C (212 F) only at normal (standard) atmospheric pressure (one atmosphere). If we increase the pressure, the boiling point temperature increases. In the ocean on the mid-ocean ridges there are volcanic vents that are constantly emitting hot water, gases and other materials from deep inside the Earth. 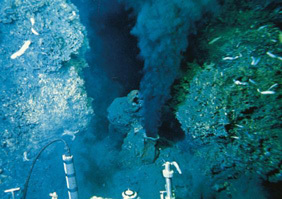 These vents are known as black smokers and they are located on the sea floor, at depths of thousands of feet. Here the pressures are many atmospheres - the pressure underwater increases by one atmosphere for about every 10m (30 feet or so) depth. So down at such depths the pressure can be 30 or more atmospheres and the boiling temperature very high. 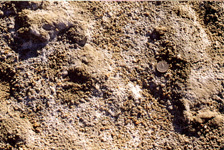 Black smokers (above left) can produce temperatures of 350 C (662 F), but archaean microbes are still able to flourish, though possibly not main-stream of the scalding flow. Nevertheless, they are close to it and must be living at very high temperatures. The water at this depth is still liquid and not superheated steam, as it would be on the surface of the sea at this temperature. One hyperthermophile that lives in this environment is Methanopyrus, which produces methane gas. It is important in the development of life because it occupies a place at the bottom of the evolutionary tree. So what does that tell us about early life on Earth - was life a hyperthermophile extremophile? That seems likely, as the Earth was a firey cauldron during its early history. The current record for temperature tolerance is held by Pyrodictium Occultum, an archaean which survived 121 C (250 F) for an hour. However, John Parkes of Bristol University has evidence of microorganisms living at 170 C (338 F) around volcanic vents on the ocean floor. The extremophiles that live around the mid-ocean ridges live at extreme depths too, where the hydrostatic pressure is enormous. But other organisms such as fish and crustaceans - lobsters - live at these depths too. The secret is for the organism to balance or equalize the internal and external pressures. Holger Jannasch leads a team of researchers at the Woods Hole Oceanographic Institution in Massachusetts. Holger is one of the world's leading experts on life around mid-ocean hydrothermal vents. The Woods Hole team found Pyrolobus fumarii, an Archaea, at the mid-Atlantic ridge in 1996. 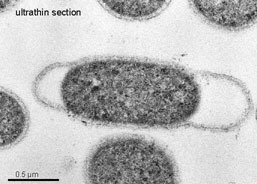 Living at a depth of 3600 meters, and at temperatures of up to 113 C (235 F) the microbe was able to survive both in the presence of oxygen and without it. It is a chemoautotroph, and survives with any intake of organic mater, on hydrogen, nitrates and sulfates. It is one of best examples, so far discovered, of a a microbe that can survive not just at one extremes but in a variety of conditions. The researchers claim that it is good evidence to reinforce the notion of life living in the watery depths below the ice of Europa. The ocean floor, and specifically the mid-ocean ridges may be like the Jupiter moon Europa. Archaea have been found more than four miles down, in the ancient lava flows of the Columbia River area of Washington State, by a NASA microbiologist . They live inside the rock itself and respire anaerobically. The pressures at these depths are over 14 tonnes per square centimeter (approx 70 tons per square inch). The bacteria feed off hydrogen gas which is given off when water seeping through the rock reacts with it. The bacteria look very similar to the Mars meteorite fossils. On Mars a similar site would have protected its living organisms from the harmful radiation that is present on the surface of the planet. Nanobacteria have been found at extreme depths in the seabed sandstone off Western Australia, as shown in this image (right). Again these survive at extreme pressures. There is growing evidence that the ground beneath our feet is not just home to a few odd archaea and bacteria, but is the habitat of trillions of microbes. Additionally, it seems to have provided a comfortable home for them for a long time - perhaps life even started in the depths below. The evidence comes from analysis of minerals. Some geologists, like Dr William A Fyfe of Ontario University, believe that mineral concentrations could not possibly have been created by geological processes. Instead, they now think that such concentrations can only be made by biological processes as a by-product of metabolism. Such minerals include gold and other precious metals. In addition of course, we find oil and gas below the ground. What role, if any, did subterranean archaea play in creating these? Scientific opinion is changing from the accepted view that it is the residue of surface life from millions of years ago, to one where it is created by underground microbes. The idea was suggested by Dr Tom Gold, emeritus professor of astronomy at Cornell University, in the nineteen-seventies but was not taken seriously until mounting evidence came from other researchers. Dr Henry L Ehrlich from Rensselaer Polytechnic Institute in Troy, N Y, says that study is only just beginning. Increasingly, the evidence is mounting that the very rocks of the earth would be totally different, chemically, without the intervention of life. Recognizing this, planetary scientists now have an additional way of assessing whether or not a planet is, or was, the habitat of living organisms. This developing science will certainly be applied to the analysis of Mars rocks and soil, when it becomes available. In the Arctic and Antarctic, life forms such as algae and lichens cling on to their existence for prolonged periods of time, waiting for the odd occasion when the temperature will be high enough to allow ice to turn to water. Conditions on Mars will be like this, but the likelihood of liquid water occurring is remote now, though it certainly did exist in the past. Amber is fossilized tree resin and it can preserve creatures trapped in it for millions of years. Bacteria were found to inhabit the gut of a bee trapped in amber and where revived after a 25 million-year hibernation according to researcher, by microbiologist Raul Cano and Monica Borucki of California Polytechnic State University. In 1995 the team announced they had revived bacterial spores from the bee. This ancient bacterium, they claimed, is genetically similar to Bacillus sphaericus, which is a modern strain. Interestingly, when subjected to adverse conditions they can go into a form of suspended animation. They stop moving and reproducing. They do without air and water. Their metabolism virtually ceases. Another bacterium that has even more remarkable properties is Deinococcus radiodurans. This includes being able to withstand high levels of radiation that would kill other living entities, including most bacteria. It can be classed as a polyextremophile. Read the full story at NASA.